For the first time in 78 years, today saw an episcopal ordination in Indianapolis, as the freshly-transplanted Bostonian Chris Coyne took office as auxiliary to Archbishop Daniel Buechlein OSB. Much has changed in the church since 1933, when Joseph Elmer Ritter -- a future cardinal-archbishop of St Louis -- became Indy's last auxiliary, named amid the ailing health of Archbishop Joseph Chartrand. And along those lines, while little is remembered of the last high-hatting by the Brickyard, odds are that Ritter's crowd didn't get to hear words like "jerk," "blog" or "wicked awesome" (not to mention the impersonation of a cardinal) at the liturgy, each and all of which figured into today's Mass-closing remarks from the 52 year-old ordinand (shown above at last night's Vespers). Then again, the moment likewise made history on a more serious front: hours after B16 dedicated his talk at today's General Audience to the patron of communicators, St Francis de Sales, for the first time, the church elevated a blogging priest to the episcopacy. 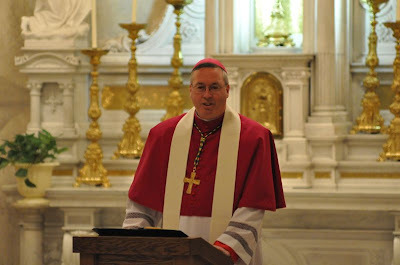 And fittingly, one of Coyne's principal co-consecrators was another new-media friendly prelate: Bishop Paul Etienne of Cheyenne, the Indy native (and rising star) who, in imitation of his good mentor, launched his own blog shortly after taking the reins of Wyoming's statewide diocese. After an opening that reflected his roots as a bartender and broadcaster, the Rome-trained liturgist shifted gears, outlining a vision and hope for the church that echoed his earlier comments on the import of an invigorated sense of evangelization and outreach, and how to carry it out. And as a result, with the US bishops slated to elect their next Communications chairman at this fall's November Meeting, it's very tempting to think that the bench might've just gotten the guy for the job.